The Province of Bohol (Cebuano: Lalawigan sa Bohol; Filipino: Lalawigan ng Bohol) is an island province of the Philippines in the Central Visayas region, consisting of one main island, Bohol, and more than 70 smaller islands. Its capital is Tagbilaran. The province is a popular place among tourists with its beaches and resorts. The Chocolate Hills, many small hills of limestone formations, is the most popular attraction. There are many hotels in the southern beaches. It is the home province of Carlos P. Garcia, the eighth president of the Republic of the Philippines (1957–1961) who was born in Talibon. The people of Bohol are said to be the descendants of a group of inhabitants who settled in the Philippines called pintados or "tattooed ones". The earliest significant contact of the island with Spain occurred in 1565. 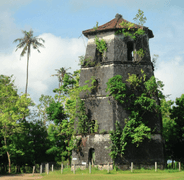 In that year, a Spanish explorer named Miguel López de Legazpi came to Bohol looking for spices and gold. He made a peace pact with Datu Sikatuna in a place called Bool. This pact was signed with a blood pact between the two men. This event, called the Sandugo ("one blood"), is celebrated in Bohol every year during the Sandugo Festival. The Sandugo or blood compact is also depicted on Bohol's provincial flag and the Bohol provincial seal. Bohol was administered as a residencia of Cebu. 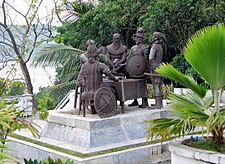 It became a separate politico-military province on July 22, 1854 together with Siquijor. A census in 1879 found Bohol with a population of 253,103 distributed among 34 municipalities. The Bohol province was created on March 10, 1917. The Bohol island has many small hills. There are two mountain ranges that run roughly parallel on the northwest and the southeast. The main mountain range of the island is Sierra Bullones on the southeast, along the south coast. It begins near Loboc, goes to the east and then to the northeast to end near Candijay. The highest point of this range and in the entire province is Mount Mayana, 870 m (2,850 ft) high. A plateau in the interior plateau of the island has many limestone hills. In Carmen, Batuan and Sagbayan, these hills form near perfect cones in great numbers and are known as the Chocolate Hills. The are many white sandy beaches along the coast of the main island and in other islands of the province. The most well known of these beaches are in Panglao Island, and there, numerous islets have similar, yet untouched and beautiful beaches. The Panglao island is relatively flat with two hills. The island is known for its beautiful beaches, and the most famous of these is Alona Beach on the south side of the island. The Lapinig island is to the northeast of the Bohol island, in front of the municipality of Pres. Carlos P. Garcia. The island is flat with hills in the middle to a height of 100 m (330 ft). 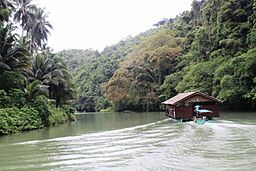 Loboc flows from the centre of the island to the southeastern coast; this is the most famous for its river cruises. Inabanga, the largest river of the island, runs in the northwestern part of the province. Ipil river flows in the north. Numerous waterfalls and caves are scattered across the island, including the beautiful Mag-Aso falls in Antequera. Bohol has, like the rest of the Philippines, a tropical climate. The average temperature is high and the humidity is also high. The dry and the wet seasons are very similar. The province is in the path of typhoons; it can be affected by them but is somewhat protected by the mountains of surrounding islands, as Leyte, Samar and Mindanao. The northeast monsoon (Amihan) is from November to April and the average temperatures are slightly lower than the temperatures during the southwest monsoon (Habagat), from August to October. The main language spoken in Bohol is Boholano, a dialect of Cebuano. In addition, Tagalog and English are also spoken by many people. 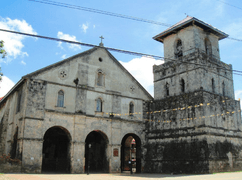 The majority of the population of Bohol is Roman Catholic. Protestants and Iglesia ni Cristo form a large part of the remainder. The Bohol province had a population, in 2010, of 1,255,128, for a population density of 260.3 inhabitants/km2. The municipality with more people living in is the capital, Tagbilaran (96,792), followed by Ubay (68,578) and Talibon (61,373). The province of Bohol is divided into 47 municipalities and 1 city.It has 1,109 barangays. Bohol (province) Facts for Kids. Kiddle Encyclopedia.